This is another of my dystopias. North America was destroyed by an ambiguous series of climate-related events, and a new country, Panem, emerged. Panem formed a Capitol in the Rockies, with 13 surrounding districts. When the districts rose up in rebellion – the Capitol always had more money and resources – the Capitol beat them back and destroyed the 13th district. Every year, the event is “celebrated” by the Hunger Games. Two children, one boy and one girl, aged 12-18, are chosen from each district to participate. They are thrown into an arena for weeks at a time, and must battle each other to the death. Last person standing is crowned champion, and they and their district is showered with food and gifts and money for a year. The Hunger Games are broadcast to everyone in Panem, all of whom are required to watch and “celebrate.” It’s reality TV turned deadly. Katniss Everdeen knows how to survive. She’s been taking care of her mother and little sister for years. When her sister is unexpectedly chosen to participate in the Hunger Games, Katniss volunteers in her place. Though the participants from her district (12) are usually disregarded, Katniss makes herself a contender in the games. As she battles on, she learns more than just how to survive. She learns the cost of life, death, and love. She learns about unfairness, and how to subtly fight against the system, despite the costs. The awful thing is that if I can forget they’re people, it will be no different [from hunting] at all. This isn’t a gory book, but it is violent. Sort of on the same level as Lord of the Flies. It involves children being forced to hunt and murder each other. It’s a gruesome subject, and yet, Collins pulls it off fabulously. She doesn’t linger over the deaths, and there is real sadness involved. The outrage is all for the Capitol and their manipulations. Every page that passes, you want the country destroyed even more for their crimes against humanity. At the same time, you feel the hopelessness of rebellion. The people in the districts simply don’t have the resources to fight. The ending is appropriately mixed. While the climax has passed, pain, confusion, and uncertainty remain waiting for the sequel. I read one review that said they’d prefer the book to end here, without a sequel, and I can see the merit in that. It ends so perfectly, so realistically, that no real sequel is needed. However, when the second book comes out next fall, I know I will be scooping it up as fast as possible. I can’t wait to delve back into this world and see how things will go next. But I’m not dying for the next book as some seem to do when they’re finished. It’s funny, because even though they’re rattling on about the Games, it’s all about where they were or what they were doing or how they felt when a specific event occurred. “I was still in bed!” “I had just had my eyebrows dyed!” “I swear I nearly fainted!” Everything is about them, not the dying boys and girls in the arena. How many people view reality TV or even catastrophes in the news with that same sort of detachment? How many have gone numb to the horrors of the world, accepting it with hardly a grimace anymore? 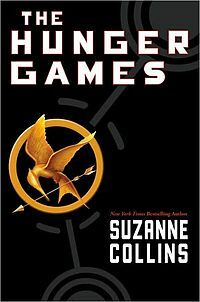 Revisited summer 2010: [Spoilers] This is my fourth read of The Hunger Games. I read it first for readathon in April ’09, right in the middle of the night, so I read it a second time that week to make sure I remembered all the details properly. I then reread it closer to the Catching Fire release in 2009. Fourth time through, I love this book just as much as I loved it the first three. The same sections made me cry, especially when District 11 sends the bread to Katniss and she thanks them aloud. That’s when my grief for Rue swells up and spills out. I love that the book is in present tense but doesn’t feel awkward. I love that even in all the violence and pain, nothing feels gratuitous or written for shock. Most of all, I love Katniss. She is so strong, so brave, so determined, and yet at the same time, because she’s been forced to focus her vision into the tunnel of survival, she’s so blind. It’s the perfect character flaw. Her blindness makes her endearing, and makes me want to root for her. I love that in everything she does, she never realizes that those around her aren’t just like her. That not everyone is playing a game or planning a strategy. She expects them to behave the same way she does, because to her, that’s what survival is all about. Those who have a strategy and a plan, she understands. Those who are selfless, like Peeta, she misjudges. It’s the perfect balance. I can’t sing this book’s praises enough. Even after four times, it’s just as wonderful. I have no expectations for Mockingjay, really, though I have this small hope that I’ll find out Cinna is still alive, even if he’s had his tongue cut out. This series isn’t like with Harry Potter, where I spent hours trying to figure out what was going to happen in the next book. I’ve never tried to look forward. Instead, I’m just looking forward to the ride! The only thing that I hope will be resolved is the love triangle. This, of course, is the big war going on all over the blogosphere. Which boy will Katniss end up with, Peeta or Gale? People who love Peeta are adamantly anti-Gale, and vice versa, so I thought I’d give my thoughts on the two boys. Peeta: He’s kind, thoughtful, protective, and desperately in love with Katniss. Some people see him as manipulative, but I disagree with that. I tried to read that into his character during my fourth read of the first book, and I just can’t. Everything he does is not for his own survival, but for hers. Having said that, I don’t think he deserves Katniss. Don’t get me wrong – I love Katniss, but she has never been able to separate out in her head the strategy she thought Peeta was using and the truth about his feelings. Their love-act is completely wrapped up in the games, something she would rather forget. They would have been good together under other circumstances. His kindness and gentleness would be a perfect compliment to her toughness and intensity. But not when they were thrown in together that way. Gale: He’s a lot like Katniss – angry, stubborn, foolhardy, focused, and the consummate survivor. The two have known each other for years and have become so close as hunting partners that they can almost read each other’s minds. Gale is also jealous, possessive, controlling, and judgmental. I get the impression that if Katniss chooses someone other than him, he’ll refuse to ever have anything to do with her again, and to me, that is not love. I don’t believe Gale loves her at all. He wants her, but he doesn’t love her. Gale is far more like a sibling than he is like a boyfriend, and if he and Katniss were to get together, their relationship would be a disaster. They are both too stubborn and alike. No one would give, and the relationship – and therefore the friendship – would rip into shreds. Furthermore, anyone who acts that jealous and possessive towards another person is someone I regard as dangerous. I could easily see Gale turning into a wife-beater in the future. He and Katniss would be better off remaining friends, assuming he would even deign to be her friend if she chooses someone else. Comparison: The difference between the two guys to me is this: Gale would protect Katniss only if he knows she will stay with him, whereas Peeta would protect her no matter what. Gale thinks about himself more than he thinks about Katniss. Peeta always thinks of Katniss first. His love for her is unconditional, which is the only kind of love that’s worth having. But even saying that, I don’t think Katniss should end up with Peeta. If she has to end up with one of them, I’d much prefer Peeta over Gale. But Katniss has been very clear through both books on this subject: she doesn’t want to get into a relationship. She definitely doesn’t want to get married and have kids! I hope so much that Katniss sticks with this decision in Mockingjay. The wavering in Catching Fire drove me crazy because Katniss has made it clear she’s not in love with either guy. She regards Gale as her brother, and his romantic feelings toward her confuse her. Her relationship with Peeta is all mixed up with the games and is very confusing as well. What Katniss needs is to grow up and be alone, unless and until she meets someone who makes her change her mind about marriage. Neither Gale nor Peeta can do that. I am 100% Team Katniss! This entry was posted in 2009, 2010, Prose, Young Adult and tagged callback, favorite, memorable, multi-read, readathon, reread, shredded me, speculative. Bookmark the permalink.